The matchmaking events are a backbone of the ECCP and it is important to see how participants experience them, what are the outcomes of the numerous meetings to explore cooperation opportunities. We present you below a few impressions shared by cluster participants. "An amazing event. I made contacts with very relevant people and we have already taken next steps in cooperation and establishment of genuine partnership between Canada and our region. I would particularly like to emphasize the organizer's readiness to add value to each activity and to encourage further connecting." Lubos Komarek, Cluster Manager of the Nanoprogress cluster (Czech Republic) shares his impressions right after the EU-Canada high level cluster cooperation event in the context of the Hanover Fair on 1-2 April 2019 that was the main anchor event of the EU Cluster Weeks initiative. ECCP: How did you experience the EU-CAN cluster cooperation event? M.N: This was the first time for me to participate in a EU cluster matchmaking event. I was very glad to be offered the opportunity to participate. The fact that you have to apply and forward information about you cluster and motivation for participating is a very good idea and helps to assure that the event is taken seriously. I liked the intro with short and personal presentations setting the scene. It was good that you had both the EU hosts and Canadian visitors in the same panel session. Also it was nice that several people stayed also for the tours and also for the reception, where we got a good chance to talk and get to know each other a little better and introduce other views. ECCP: Did your participation make a difference for your cluster? M.N: I got a chance to meet both with the Canadian delegation and also made new contacts to European clusters that I did not know before. The talks I had with individuals from Canada – especially the ones related to Advanced Manufacturing – gave me an interesting insight, that inspired me to sign up for the Toronto event. The fact that the Hannover EU-Can event was so well organized and the content and people attracting, have given me the proof that using time and resources for the Toronto event can be worthwhile. I would most likely not have signed up for the Toronto event, if I had not had the good indications from the Hannover event. ECCP: Are there any learnings/outcomes/future perspectives for collaboration? M.N. : It was very effective this way to get to know people much better than through a telco or an event with just presentations. The discussions in sub groups where all participants gave a short intro was very effective. I also enjoyed the bus ride talks – a big bus giving the possibility to move around and talk to several people was a good idea. Some of us could confirm that we would already meet again at EUREKA event in Manchester in May. Also I had a chance to bring some information about European projects to the table, where for instance I4MS and C-Voucher could be of interest for the Canadians. ECCP: Any concrete ideas for next steps? M.N: Writing and sharing one-pagers on concrete project ideas is definitely one important step forward. Perhaps a template for such ideas in a very short form could be a push towards more concrete cooperation. Physical meetings are always a good way to make sure things progress – this way having the Bucharest Cluster event, the Manchester EUREKA event and the Toronto CAN Supercluster event coming up is good motivation. Supplementary perhaps announcing a follow up telco could be a good idea – for next time. Finally I would just express my thanks for organizing the EU-Canada event in Hannover - it was indeed rewarding and a pleasure to participate. 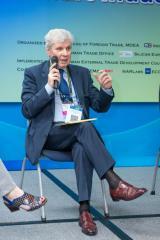 "The EU-Canada Cluster Cooperation Event at Hannover Messe was a great success from my perspective. It gave me, as leader of Canada’s Advanced Manufacturing Supercluster, a good opportunity to meet other cluster leaders who are interested in partnering with Canadian companies and cluster initiatives. I made many friends over the two days of the event and learned much about the common challenges we all face and a great deal about best practices in encouraging collaboration on the part of companies, and especially the engagement of SMEs, in cluster initiatives. I’m struck by how much we share in our objectives as cluster leaders, and how important it is to work together to learn from each other and to find new opportunities for our members. It is important for Canadian companies to find partners in the EU, but our shared ambition is really global in scope. I know that we will be following up on the contacts we made in Hannover. And, I look forward to welcoming a delegation of European clusters to Toronto in June." "This was the first time I have attended a EU Cluster event, as part of the EU -Canada initiative, on behalf of ReMAP cluster. ReMAP - Refined Manufacturing Acceleration Process is focused on advanced manufacturing and bringing electronic and optical products to market. I found this event very productive. We face similar challenges, and we can work together to be more relevant to the global economy. There were formal opportunities to connect with similar clusters in the EU and there were informal opportunities to create relationships and potential future partnerships. I am looking forward to the cluster event in Toronto in June 5-7, where some of the ReMAP members can connect with the EU clusters, and collaborate on bringing globally competitive products to market." After attending the “EU Cluster Mission to the USA”, the Maritime Technology Cluster FVG S.c.ar.l. had the possibility to keep the contacts with American clusters and enhance the collaboration among two territories. Both in Autumn and in March the cluster representatives met The Maritime Alliance cluster in Venice and London and discussed about tools and means to link the two territories and respective enterprises. Forthcoming, in March in Rome, a dedicated networking event was organized among Italian and American enterprises and other research centers and aggregation players. The Maritime Technology Cluster FVG S.c.ar.l. had the possibility to meet again The Maritime Alliance and also to meet the cluster MIST, sharing ideas of collaboration and events or initiatives organized by both sides that could be joined and diffused not only by clusters but also to enterprises. In this sense, the mission to the USA has represented for the cluster an important moment to strengthen relations and to increase cooperation and exchange of best practices. Enterprises had an overview of stakeholders active in technology and production sectors, their role, how to get in contact with them and how be supported to relate and collaborate with them. 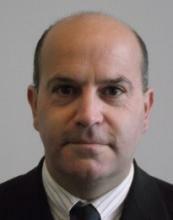 Carlo Kraskovic, Project Manager Maritime Technology Cluster FVG S.c.ar.l. “The High-level EU Cluster Mission to the US was a great opportunity to understand how the innovation ecosystem works there. We had an opportunity to exchange experiences with different kind of entities, from business support institutions, through R&D institutions, up to the VC ecosystem. It was a fruitful set of C2C matchmaking meetings and direct visits at local institutions. 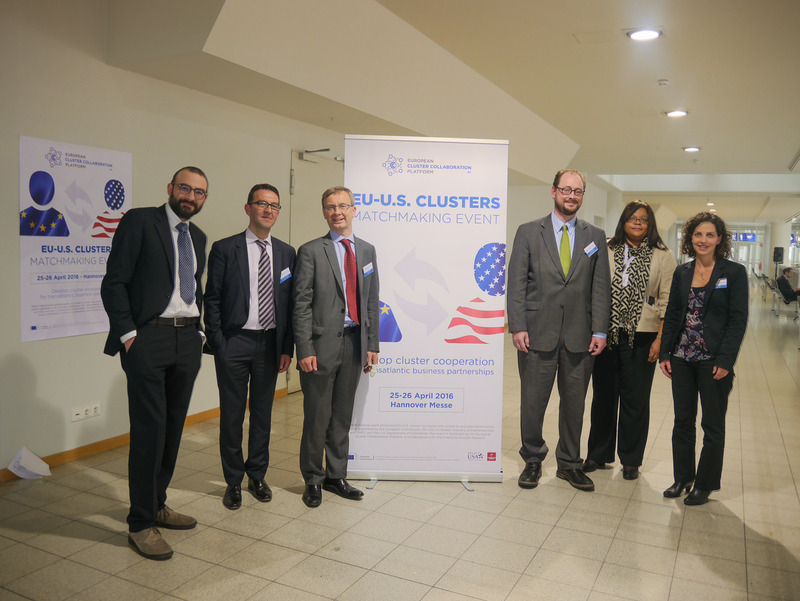 “Thanks to everyone involved in the EU-US Bilateral Cluster Mission. I can’t speak highly enough of what a fantastic opportunity it was for Cambridge Cleantech as a technology cluster. I met over 70 potential collaborators and since returning have already followed up with 3 potential partner organisations with concrete next step actions, (two meetings scheduled in London and an outline for a US-EU Summit on Smart Grid Technology). Participating on the mission with over 20 other EU technology clusters was also extremely valuable and has exponentially grown our international network with other technology clusters in Europe within the space of just a few days. Likewise, this has already led to a concrete joint bidding activity for cluster collaboration. « The European mission was a very fruitful event for us. From one part, the program explorating the US East Coast provided us a good picture of the innovation and economical practices, which is very different compared to the well-known Silicon Valley. We met very open-mindset counterparts, with a real willingness to build collaborative projects with European entities. “During the High-Level US-Cluster-Missions, I gathered lots of useful information and even more contacts for our cluster and the members, respectively. The learnings for our cluster regarding the remarkable entrepreneurial and seed-capital as well as VC ecosystem in Philadelphia (PE) and Boston/Cambridge (MA) will help our members, once they start their business in these regions. Stefan Uhlig, Senior Projektmanager, Cool Silicon e.V. “It was a very interesting, useful visit for our cluster from the point of view of companies as well as research institutions. We could collect a lot of good examples of bridging industry and academia, rules of conducting research projects for companies, we could get familiar with and understand the American approach to interactions between science and industry, even if it is not called “cluster interactions”. “The US cluster mission including the matchmaking event during the TechConnect Conference has been very fruitful by giving the opportunity to better understand the way American clusters are acting and developing their innovation eco-systems. This enabled to get leading edge practices in the combination of technology and business oriented communities for the benefit of start-ups and innovative companies. For our particular interest, we have been able to build up promising connections with cluster or economic development organizations in Pennsylvania such as Ben Franklin Technology Partners, or in Ohio such as Team Neo, as well as Mass TLC in Massachusetts. “The mission was helpful to understand how the innovation and acceleration services work in the USA. 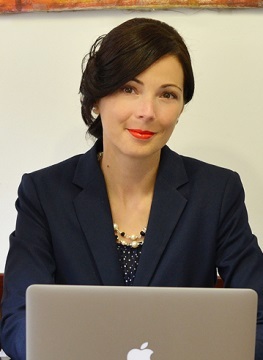 We got to meet different kind of entities and organisations that can be approached when searching for partners to support companies in their internationalisation processes, whether it is to open an office, analyse the market, develop joint projects or search for potential investors. The visits held in both Philadelphia (PA) and Boston (MA) gave us clusters a good perspective on the interest and goals of the US’ organisations we met and allowed us to start a dialogue that can lead to collaboration and cooperation with them. “EU Cluster Mission to USA has been significantly important to further Lublin Medicine - Medical and Wellness Cluster development. During five days, thanks to good organization of the mission we had an opportunity to meet a number of key market and research players. We have gained the knowledge about the US system supporting economic and scientific development. We could also discuss the business model of our potential partners. “The mission has represented a great opportunity to getting aware about innovation and technology development framework in the USA, providing information on several actors with different competences and roles. Since our cluster is involved in the maritime technologies sector, during the matchmaking event we had the possibility to meet three American cluster focused on different maritime and marine topics. “The matchmaking event in Washington, DC, was efficient for me, as I could discuss some opportunities of collaboration for our cluster and our members. As for the visits, I would be interested to learn more about the access opportunities and mechanisms for European companies to the Manufacturing America program that was presented to us. “The Cluster Matchmaking Event organised in the context of the European Innovation Week in Taiwan (May 30th – June 1st 2016) allowed GAIA to establish contacts with other clusters and business associations in the ICT and electronic sector. 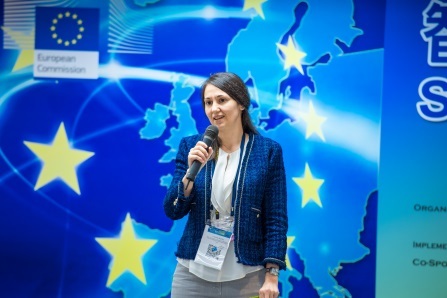 “The seminars presented at the European Innovation Week explored a wide range of very interesting topics, focusing and capturing at any time the attention of the audience. The material provided during the event was useful to better follow the topics, as well as a starting point to be able to individually develop certain opportunities. On top of all, this event has been a great opportunity to meet clusters and business persons and local companies. The event gave to all of us, I believe, a quite deep insight in the local economy, paving the way for future developments and contacts. The company visits were absolutely of interest and for sure gave us the flavour of the development spirit and the possibility to have direct contacts with high level management bodies, setting a first link which may open interesting perspectives for the future. Last but not least, The European Innovation Week was very well organized in terms of contents, choice of hosting structures, as well as from the logistical standpoint. Outstanding support by the staff of TAITRA, ITRI, ECCT, BOFT and SPI (among others) has been of great help both in the pre-mission preparation phase (registration, profiling, meetings management planning) as well as during the whole week. Travel management has been of great help in optimizing the use of the time, always too short during these events. “We, the Bulgaria ICT Cluster, were part of the EU ICT Clusters Delegation to Taiwan at the European Innovation Week within Computex in Taipei. As part of this week, we had great one-on-one meetings and networking events, giving us the tremendous opportunity to initiate business cooperation with Taiwan. With the exceptional organization of the event, we very effectively met numerous Taiwanese companies and associations, as well as EU clusters with which we can intensify or initiate collaboration as organizations, but also for our member companies.